Jessica Maldonado needed 11 credits to graduate from high school and RGCCISD Chance2B Education Center provided the necessary online courses that enabled her to meet her high school graduation requirements on February 8, 2012. Jessica Maldonado was raised in a family of four and moved from Cerralvo, Nuevo Leon, MX when she was three years old. She attended Ringgold Elementary, North Grammar Elementary, Hinojosa Elementary, Ringgold Middle School, and Rio Grande City High School. Jessica is the first in her family to graduate from high school. Ms. Maldonado would like to pursue a career in Psychology. She was honored for her achievement on February 23, 2012 at RGCCISD Chance 2B Center. Congratulations Jessica for your accomplishment and best of luck on your future endeavors. Juana Toscano needed 6 credits to graduate from high school and RGCCISD Chance2B Education Center provided the necessary online courses that enabled her to meet her high school graduation requirements on February 21, 2012. Juana Toscano was raised in a family of six and moved from Cerralvo, Nuevo Leon, MX when she was eight years old. She attended Roque Guerra Elementary, Ringgold Middle School, and Rio Grande City High School. Every summer, she migrated to Lubbock, Texas to work on the cotton fields. She got married and dropped out of high school seventeen years ago. She has four children and decided it was time for her to finish high school and pursue a Nursing career. Juana is the second in her family to graduate from high school. She was honored for her achievement on February 23, 2012 at RGCCISD Chance 2B Center. Congratulations Juana for your accomplishment and best of luck on your future endeavors. Chance 2B Education Center provided the necessary online courses that enabled him to meet his high school graduation requirements on March 11, 2012. Eric G. Alanis was raised in a family of three. He was born in Bakersfield, California and was raised in Rio Grande City, Texas. He attended General Sanchez Elementary, Ringgold Middle School, Veterans Middle School, and Rio Grande City High School. 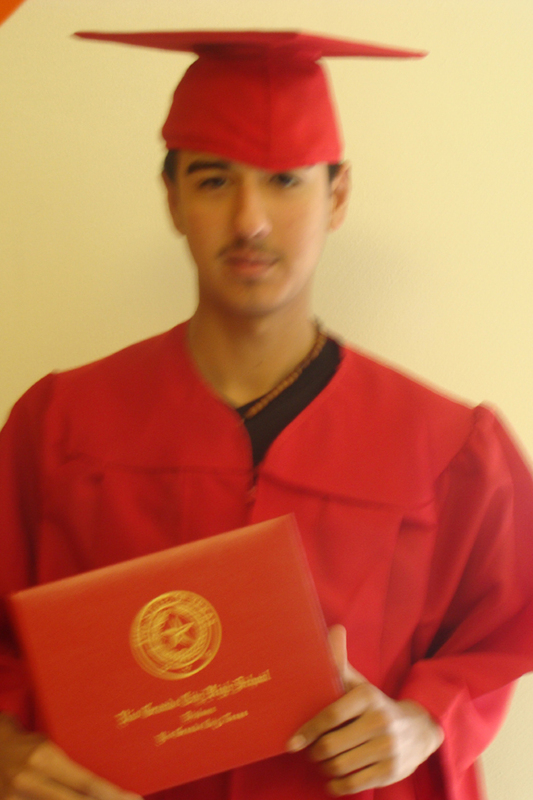 Eric G. Alanis is the second in his family to graduate from high school. He is interested in pursuing a career in border law enforcement. He was honored for his achievement on March 11, 2012 at RGCCISD Chance 2B Center. Congratulations Eric for your accomplishment and best of luck on your future endeavors.